Tomorrow we will enter Yellowstone National Park. It's unlikely we'll see any grizzly bears or wolves in the park. And even if we do, they'll probably (hopefully!?) be too far away anyway. So tonight we visited the Grizzly and Wolf Discovery Center in West Yellowstone, Montana. The grizzly bears at the center are all unable to live in the wild for different reasons (they've been orphaned or are a danger to humans). At the center, they get a second chance, and help with the education of visitors. 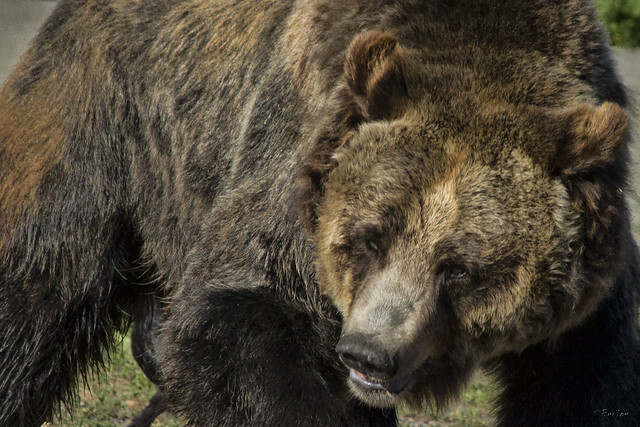 Grizzly bears are no longer listed as an endangered species, but they are still considered to be threatened. We learned about what to do if faced with a grizzly. (If they attack defensively, drop and play dead. If they attack aggressively, fight for your life.) And we learned about their keen sense of smell, and watched them find food that had been hidden in their enclosure. But my favorite animals at the center are the two packs of gray wolves (above and below). 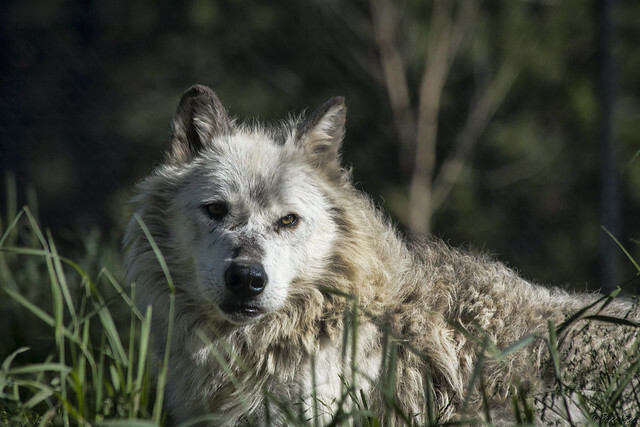 There is something beautiful about a wolf. These wolves are all captive-born. 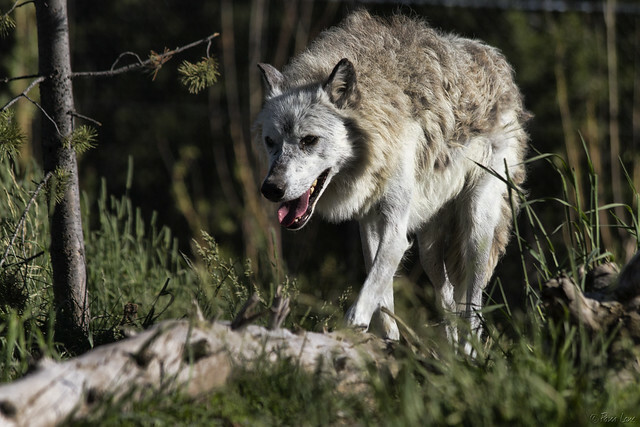 Gray wolves were reintroduced to Yellowstone in 1995, and the population has recovered to the point that the wolf is no longer on the endangered species list. Listening to our guide explain their behaviors, I gained new understanding of my very wolf-like Husky back home. For example, face-licking is a sign of submission to the leader of the pack. "The wolf is neither man's competitor nor his enemy. He is a fellow creature with whom the earth must be shared."